OK, here’s the PART 2 of my lemony creations. The recipe is here. This lemon curd tastes very good, but next time I’m going to try grating the lemon zest instead of finely shredding it, just to see which I like better. BTW, this is my first encounter with lemon curd, to be honest. I’ve heard/read about it and been wanting to make it myself someday, but never actually tried it until today. So I don’t know much about how to use it. What do you eat lemon curd with? Do you use this for baking? Any recommendations? Thanks for all your suggestions, dear readers. OK. 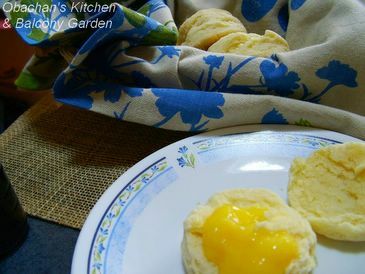 I tried lemon curd with scones this morning, as a starter. Konnichiwa, Obachan! 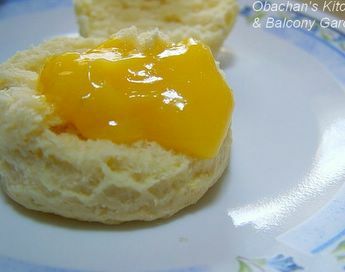 Lemon curd is regularly used for filling tarts and pies in England. Sometimes, it's even used for filling Victoria Sandwich cakes. It's also pretty good for spreading with butter on toasted (or even untoasted) white bread. Gooey lemon & Bon Jovi at the same time...now that's a woman who knows how to enjoy life LOL! 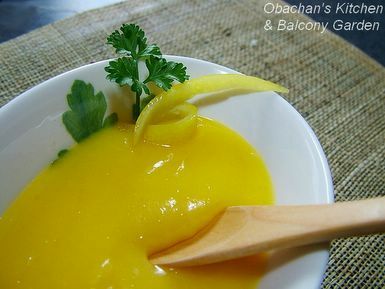 hiya Obachan, I've eaten stuff similar to lemon curd in donuts and meringue pies. Your posts are stimulating my citrus-happy taste buds!! Just curious, are you doing anything with the leftover lemon peels? I love to dollop some on scones. Another friend of mine loves to eat lemon curd and peanut butter sandwiches. It is common to put them in tarts, too! Oooh lemon curd! One of my favourite things in the world! It's good ON anything and it's even better IN something. They are especially good on plain white cupcakes. Many of the older ladies around here make butterfly cupcakes with it. They take a regular cupcake, slice off the top rounded bit, put a dollop of the curd on, cut the sliced-off hill of cupcake into two, flip them the opposite direction so the rounded edges face each other in the middle and press them this way gently into the curd and voila! Butterflies on top. Some even cut a little well in the middle of the bottom part to get an extra dollop of curd in the center. I myself will be trying it in my search for the perfect thumbprint cookie soon. I could let you know how they turn out! PS: Yes, black poppyseeds (well they start out a dark blue-grey but in cooking are more a black colour) are the absolute norm here in my part of North America. I knew white poppyseeds existed but never really saw any before. Your pictures are making me think of making a lemon-curd trifle. I bet it would pair beautifully with blueberries. For me, it usually goes straight into a baked, cooled pie crust, sometimes topped with meringue... You can use an american pie crust or pate sucree. (That one is a lime curd, but the principal is the same). I also have been known to use it in a fried tart dusted with powdered sugar. Lemon meringue pie! that's the only way I've tried it. Looks good. We make tiny lemoncurd tartlets with a blob of sweetened whipped cream on top (it helps to cut the acidity) You can also use it to fill cakes. 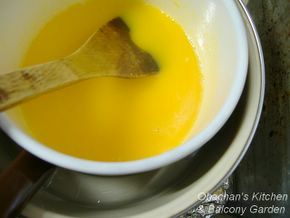 And if you want a variation, you can put some passionfruit pulp into the curd while you are making it - divine! I really enjoy reading your blog - thanks! Konnichiwa! :D Now here’s something new to me. Victoria Sandwich cake? OK. I googled and now I know what it looks like. Yeah, lemon curd must be a nice filling for this kind of cake. Lemon curd in donuts sounds awfully tempting. I used some of the leftover lemon peels for something else (I’ll post about it soon… hopefully) and threw away the rest. Sounds like tarts is a popular idea. I might give it a try sometime soon. Ah, the butterfly cupcakes sound so lovely! Yes, yes. Let me know how your thumbprint cookies turned out. Sounds like black poppyseeds are far more popular than white version outside Japan. Interesting. Trifle! That’s something I’ve heard (actually read) about but never tried yet. But lemon-curd trifle with blueberries sounds so beautiful. I really think I should try some kind of tart this weekend. The color combination sounds awfully tempting. Yeah, meringue. I’m ready to google for a recipe. Konnichiwa--I've been reading for a while, but this is my first post... But I had to say something about Lemon Curd! It's a long-standing tradition in my mother's family (they are from Mississippi) that the family "birthday cake" is a white cake with lemon curd between the layers and frosted with divinity icing. My mother made me this cake for my birthday nearly all my life. I just made my first batch of lemon curd last month, for my own birthday (but I used a lemon chiffon cake and a light lemon-and-mikan glaze--I love lemons, and the divinity icing is too sweet for me anymore). My mom's family also makes lemon-custard cups--baked vanilla meringue nests (like these) that you scoop lemon curd into and then top with whipped cream. Thanks for your comment. Your family birthday cake sounds sooooooooooo scrumptious! What part of Mississippi is your mom from? I have lived in Hattiesburg for more than 3 years. Wow, lemon curd in home economics class. I bet the whole classroom smelled wonderfully. I still remember what we made in ours... the first baking experience was sugar cookies, and the second was some kind of butter cake.